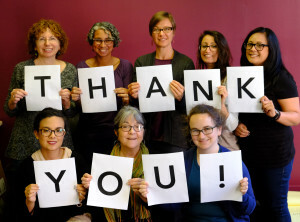 Thank you to everyone who organized or spoke at an event to celebrate the publication of Barbara Brenner’s book, So Much to Be Done: The Writings of Breast Cancer Activist Barbara Brenner: first and foremost, Susie Lampert, Barbara’s wonderful partner, who traveled across the country and world sharing Barbara’s powerful words and legacy with people; Rachel Morello-Frosch, Catherine DeLorey, Linda Burnett, Heather Sawitsky, Anne Josephson, Angela Wall, Grazia de Michele, Jerry Epstein, Rob Dorit, Judy Norsigian, Beverly Canin, Diane Tompkins, Rebecca Farmer, Barbara Sjoholm, Helen Lynn, Marivi Fernández Sánchez, Ana Porroche-Escudero, Senior Research Associate, NIHR CLAHRC NWC, Cheri Pies and Melina Linder, Steven A. Brick and Ann Veta Brick, Kathleen J. Purcell, Elizabeth C. Pritzker, Ellen Greenberg and Duncan Watry, Cheri Bryant, Claudia Cappio, Karen Glickman and M.C. Duboscq, University of Minnesota Press, Jane and Michael Rice, Elaine Elinson, Pauli Ojea, Theresa Wang, Sara O’Donnell, Rabbi Margaret Holub, Abby Abinanti, Dorothy Ehrlich, Roberta Gelb, Nanci Grail, Joan Biren, Karen Strauss, Barbara Blumenthal, Emily Doskow, Chiara Bodini, Lina Casadó-Marin, Jordi Roca-Giron, and Araceli Munoz. Thank you to Dr. Lonny Shavelson for the time & expertise he shared with staff about the Death with Dignity Act. Thank you to Alex Parkin for generously providing us with much-needed graphic design assistance. Thank you to Pam Rich for helping us think strategically at our Board/staff retreat. Thank you to Board Member Shobita Parthasarathy and former intern Molly Welch for hosting a houseparty for BCACtion at Shobita’s Ann Arbor home in October. This event helped raise crucial funds for BCAction and introduced new people to our work. Thank you to our fearless Don’t Pink For Me online fundraisers Julie Morgan and Priscilla Rosenwald for raising almost $6,000 from friends and family through email and social media. Thank you for sharing your stories on behalf of BCAction. Thank you to everyone who made our 6th Annual Action Speak Louder Than Pink – Food for Thought event such a success!